What is EC or should I say Electronic Conspicuity or even ADS-B In and Out? And why do we care anyway! In today’s world of aviation, technology is becoming the norm and if that helps to increase safety then I for one am in favour of it and I hope you are too. It was not long after I got my NPPL that I was using and EC in the form of the then beta product of an upcoming technology called Pilotaware. Fast forward a number of years and Pilotaware, SkyEcho 2, Stratux, Power FLARM and more are all affordable in cockpit EC devices. Add to these the traditional transponders which have various modes A, C and S as well as ADS-B Out and some systems having ADS-B In and then there is weather reception, TCAS and secondary surveillance radar (SSR) too! 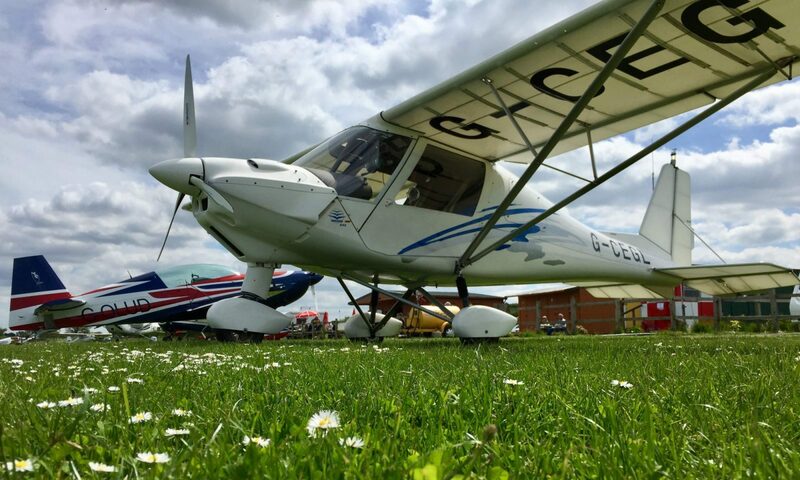 So as a member of both the UK Microlight and GA community what is best for me and what do all the TLAs (Three Letter Acronym) mean? ADS-B stands for Automatic dependent surveillance-broadcast, for your starter (yes I know that is a four-letter acronym). But first to set the scene, I would not consider myself an expert, but I do have some knowledge having researched the subject to enable me to write my transponder decode application which is available for free download from this site. The short version of this blog is that I remain happy with my current combination of devices, which consist of ADS-B Out, and Pilotaware for ADS-B In and Pilotaware device reception including OGN (Open Glider Network) when near a ground station that is up-linking and all displayed on SkyDemon. Mode A: In response to Mode A interrogation the transponder transmits an identity code for the aircraft in the octal range 0000-7777 the Squawk code. Mode S: Mode S has over 17 million unique 24-bit aircraft addresses known as the ICAO number or mode S address allowing the unique identification of every aircraft, altitude reports in 25 feet increments and the call sign (or tail number) is transmitted along with other information also. Unlike traditional Secondary Surveillance Radar (SSR) stations which elicit multiple replies containing the same information from all aircraft within their range, Mode S makes selective (Mode S is abbreviated from Mode Select) interrogations of each specific aircraft. ‘All call’ interrogations are also made to identify new aircraft to be interrogated. Mode S transponders are backward compatible with Mode A/C radars. Civilian Mode S supports a number of different messages Each message has a particular purpose. The formats DF0, DF4, DF5, DF11, DF16, DF20, DF21 and DF24 are used in civil aviation at present. Now some people think as they have a mode S transponder it transmits their position and that their exact location is displayed to other aircraft, but this is not the case. Location information is transmitted in the ES (Extended Squitter) messages DF17 and DF18. For a mode S transponder to transmit ES DF17 (we will come to DF18 later) the transponder must be connected to a position source i.e. a GPS, and these come in different levels of certification from uncertified up. This configuration is known as ADS-B Out. It is DF17 (and DF18) that devices like Pilotaware and SkyEcho use to show the exact location of other Aircraft. For non-ADS-B Out aircraft, they use the signal strength only to show proximity but, not location and they show altitude received too. If only ADS-B Out gives the position how does Flight Radar 24 and 360Radar work their magic and show position of the other aircraft without ADS-B Out? Well, this is done by a system called MLAT which is out of scope for this blog as it requires multiple ground stations. So DF18, this is essentially the same as DF17, however, it is the message used by a new breed of EC devices which are low power and low cost. They are regulated under CAP 1391. CAP 1391 (First published 2016) specifies Electronic Conspicuity devices that have the ability to signal their presence to other airspace users, thereby turning the “see-and-avoid” concept into “see-BE SEEN-and-avoid”. It must be noted that CAP1391 states that they must not transmit if carried in an aircraft equipped with a Mode S transponder as this will result in mode S messages and DF 18 being broadcasted. A system receiving DF18 implicitly knows it cannot interrogate that device, hence no aircraft can transmit DF18 if it has a mode S transponder as it will block or confuse SSRs (CAP1391 6.35). You cannot switch your mode S transponder off due to SERA.13001. SERA.13001 requires the pilot of an aircraft equipped with a serviceable SSR (Mode S) transponder to operate the transponder at all times during flight. Additionally, these new devices are intended for UK Annex II aircraft; non-complex EASA aircraft of <5700kg MTOM and for gliders and balloons. (CAP1391 Executive summary 7). Lastly, they do not allow access to TMZs. Mode S sends more information then just the location received from the location source, it sends information about how reliable that data is and if it were to fail, the size of containment that is required and more. The data that most advertisers quote is the SIL value but, this is just one of the parameters. Much is made of some of some of the new devices having a SIL1 GPS in their ads, however, most have an SDA of 0 which means they are not trusted! SIL (Source Integrity Level) field is used to define the probability of the reported horizontal position exceeding the radius of containment defined by the NIC value. 0 is unknown integrity or untrusted! SDA (System Design Assurance) field defines the failure condition that the ADS-B system is designed to support. NIC (Navigational Integrity Category) is reported in conjunction with the SIL, NIC of 0 is unknown integrity or untrusted! Can I be seen on TCAS? Yes, if you have a mode C transponder because most TCAS system utilises an aerial array to determine the position of other aircraft using mode C transmissions. TCAS II has to be linked to a mode S transponder if fitted so its presentence is encoded in the mode S messages. But TCAS systems below version 7.1 don’t use the ADS-B out messages from other aircraft. TCAS II Hybrid Surveillance does use Mode S messages but currently has limited adoption. Hybrid surveillance is a method that decreases the number of Mode S surveillance interrogations made by an aircraft's TCAS II unit. This feature, new to TCAS II version 7.1, may be included as optional functionality in TCAS II units. TCAS II units equipped with hybrid surveillance use passive surveillance instead of active surveillance to track intruders that meet validation criteria and are not projected to be near-term collision threats. With active surveillance, TCAS II transmits interrogations to the intruder's transponder and the transponder replies provide range, bearing, and altitude for the intruder. With passive surveillance, position data provided by an on-board navigation source is broadcast from the intruder's Mode S (ADS-B Out) transponder. The position data is typically based on GNSS and received on own aircraft by the use of Mode S extended squitter, i.e. 1090 MHz ADS-B, also known as 1090ES. Standards for Hybrid Surveillance have been published in RTCA DO-300. The intent of hybrid surveillance is to reduce the TCAS II interrogation rate through the judicious use of validated ADS-B data provided via the Mode S extended squitter without any degradation of the safety and effectiveness of TCAS II. Should you buy a CAP 1391 device such as a SkyEcho 2? Well that’s up to you but, if you have a Mode S transponder you will need to disable the only feature it has over Pilotaware, which costs less and has mode compatibility with other systems. If you don’t have a Mode S transponder then Yes, it is an option and will increase your visibility, but not to most TCAS equipped aircraft including military jets and helicopters as they are looking for mode C transmissions. Finally, for me a proper transponder with ADS-B Out (certified GPS or uncertified) is also essential in the increasingly busy skies for your visibility and Pilotaware as your ADS-B In device gives you the best low-cost solution currently. Today I was told a story of an instructor doing a PFL and they got a Mode C alert on Pilotaware but, at first could not see the other aircraft. Then at a low level saw a chinook below them. The instructor’s aircraft also had a transponder with Mode A/C and S also with ADS-B out, so the TCAS in the Chinook would have been going off too. “see-BE SEEN-and-avoid” in action. Next PostNext PilotAware and Skydemon the perfect VFR pairing?